Gather Your Family for a Great PA Dutch Home-Cooked Meal! Who doesn’t remember coming home to the aroma of food that mom or grandma has been simmering on the stove for hours – and the joy of sharing that home-cooked meal with family and friends. That’s the kind of memories Dienner’s lives – and cooks – for. 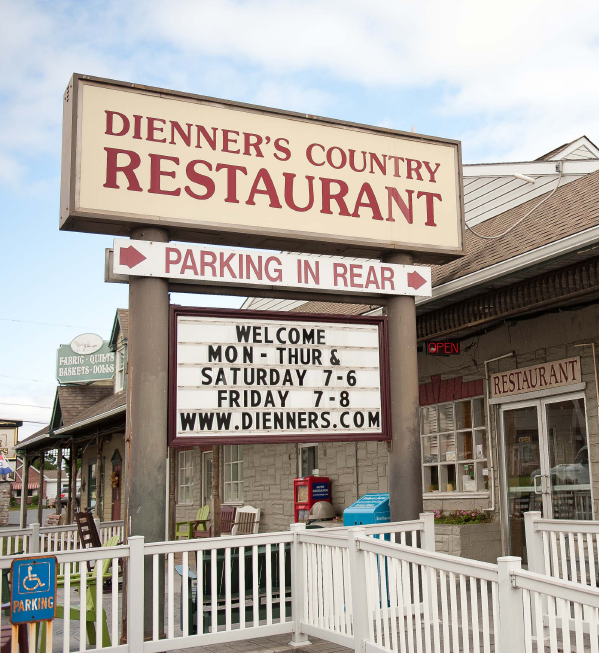 And that’s exactly the kind of atmosphere you’ll find inside Dienner’s Country Restaurant. The moment you walk through the doors and see and smell all the Lancaster County favorites, you’ll have a childhood flashback – because the foods are like the ones you grew up with! Stick-to-the-ribs dishes like roast beef in gravy, mashed potatoes, buttered noodles, mac & cheese and stewed tomatoes and, for breakfast, cooked oatmeal, sausage gravy, and even scrapple. Whether you choose made-to-order items from our extensive menu, or partake of one of our famous Breakfast, Lunch, or Dinner buffets, you and your family are sure to make some fond new dining memories. Inquire about our Children’s Buffet and Buffet to Go prices! "Fantastic food with great flavor!" I'll be back!! Loved the food. We had the food from the buffet. It not only tasted great but looked good too. A little tricky to find, just past Miller?s heading east on the left. "Great food at a reasonable price"
One of our favorite eating establishments. Always great food, great service and pleasant folks to handle the crowds that are there. We have been coming here for years! We love this place because the food is great, the price is right, and the atmosphere is relaxed! Come and see because you won't be disappointed! "My first vacation in Lancaster and..."
Looks small from the outside, but big inside. Nice buffet with fresh food. They have a great breakfast too with good country cookin'. Will go back next visit and subsequent visits too!